On June 7, various social organizations marched to commemorate the 16th anniversary of the El Charco Massacre, near Ayutla de Los Libres, where on June 7, 1998, eleven people were killed by soldiers of the Mexican Army. “[The] person who is guilty of all is Angel Aguirre Rivero, who was governor at that time as he is today. Therefore, he should be in jail,” said Nazario Gatica, one of the survivors. During the march, the cartels also demanded the release of the members of the Community Police-Regional Coordination of Communal Authorities (CRAC-PC), who are imprisoned at present. During the morning of 19 March, a police operation carried out by federal and state units took place in the municipal head of Tixtla. The police intervention had the objective of observing five search-orders and several arrest-orders against members of the Regional Coordination of Communal Authorities-Communal Police (CRAC-PC) from the El Paraíso Justice House, Ayutla de los Libres municipality, which had been indicated by the state governor Ángel Rivero as having links with guerrilla movements. The operation resulted in the arrest of Aurora Molina González, sister to Gonzalo Molina, leader of the communal police who was arrested last October, accused by the state and municipal governments of terrorism and links to guerrilla movements. According to official reports, Aurora Molina had taken control of the communal police of Tixtla following her brother’s arrest. During the departure of the police convoy, several confrontations took place between police and youth from the Rural Normal School of Ayotzinapa, which lies adjacent to Tixtla. In the afternoon, there was held a march to the Tixtla City Hall to demand the release of Aurora Molina and 12 others detained from the CRAC, whom the protestors qualified as political prisoners. In the past year, there has developed a crossfire of accusations between the Communal Police and the Tixtla mayor, Gustavo Alcaraz (PRD), whom the former accuse of being allied with organized crime, while the latter accuses the Communal Police of being a destabilizing force linked to guerrilla movements and directed by persons from outside the region. Beyond this, during the night of 19 March, there was produced an armed confrontation between members of the Communal Police pertaining to the group of coordinator Eliseo Villar Castillo and members of the CRAC, who accuse Villar Castillo of embezzling 740,000 pesos. 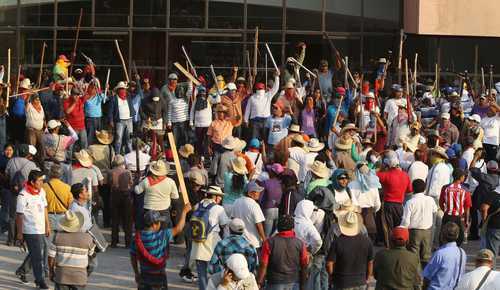 What is more, they sought to take the San Luís Acatlán House of Justice unarmed. The confrontation ended with the intervention of the Army, which entered the CRAC offices to disarm the followers of Villar Castillo. 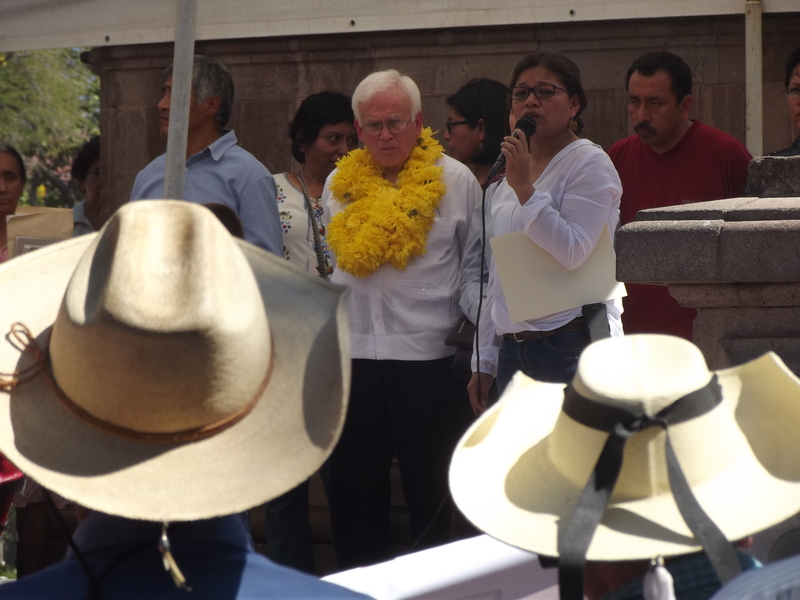 On 11 February, the caravan “A light against impunity” led by the bishop of Saltillo, Raúl López Vera, visited the municipalities of Ayutla de los Libres and Acapulco. In Ayutla de los Libres, there was held a march comprised of indigenous persons, members of social organizations such as the Organization of the Me’phaa Indigenous People (OPIM), and communal police from the Regional Coordination of Communal Authorities (CRAC). Upon the arrival of the march to the principal plaza, a rally was held. Survivors of the El Charco massacre demanded from bishop Raúl Vera López the demilitarization of the region and compensation for the deaths of the 11 campesinos killed by the Mexican Army nearly 16 years ago. Families of the Communal Police from the El Paraíso House for Justice demanded the release of nine detained persons being held in Acapulco. Raúl Vera López called on the state government to invest in the communal system of the CRAC, which he finds to be “exemplary” as an alternative to harassment and incarceration. He called on members of the CRAC to protect the authenticity of their organizational process and not to allow themselves to be corrupted. He also pronounced himself in favor of the clarification of the El Charco massacre and a cessation of the militarization of the area. The caravan ended this same day in Acapulco, where it also held a rally in the zócalo. 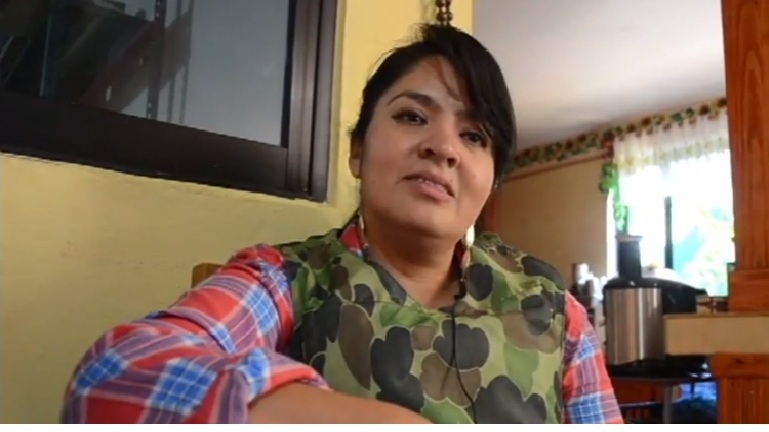 Nestora Salgado García, coordinator of the Communal Police of the Regional Coordination of Communal Authorities (CRAC) in Olinalá, was on 21 August detained by units from the Army, Navy, State Police, and Municipal Police. The state forces forced her to board a helicopter, and her whereabouts are unknown. As a response to the arrest of Salgado, the communal police of Tixtla blockaded the federal highway between Chilpancingo and Chilapa, toward the end of impeding that she be taken before the Federal Attorney General’s Office (PGR) in Chilpancingo. More than 250 members of the CRAC marched the following day in Guerrero to demand her release, together with that of dozens of other comrades of theirs who are incarcerated. 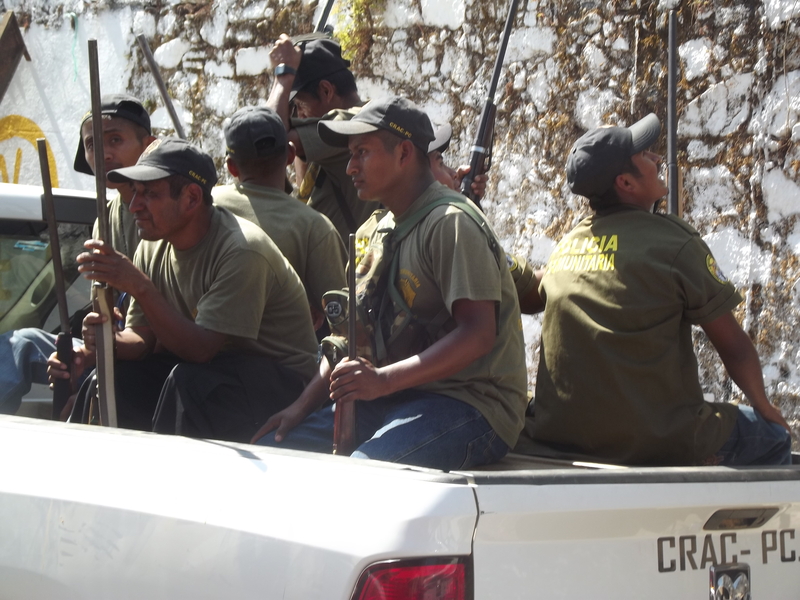 In parallel terms, close to 500 soldiers and marines invaded the community of E Paraíso, Ayutla de los Libres municipality, in the Costa Chica region, where they forcibly released some thirty persons who had been held by a CRAC faction, including a PRI leader from Olinala and his collaborators. The previous week, in the Huamuxtitlán community, the Communal Police of Olinalá indicated that Salgado García had detained this PRI leader, Armando Patrón Jimémez, and five others for having covered up the crime of two shock groups; she had them transferred to the justice house of El Paraíso to be prosecuted. The government of Ángel Aguirre Rivero accused Nestor Salgado of having kidnapped this PRI leader through the State Attorney General’s Office. 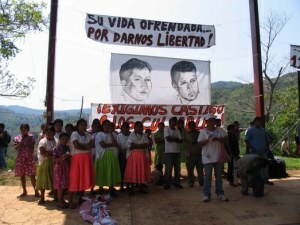 On 2 August, the Collective against Torture and Impunity (CCTI) reported that Julián Blanco, one of the leaders of the Council of Ejidos and Communities Opposed to the La Parota Dam (CECOP), was harassed for the sixth time by soldiers who seek clarification regarding his supposed use of firearms that are for the exclusive use of the Army. Blanco denounced that on 31 July, soldiers newly invaded the Los Huajes community, installing themselves at the home of Blanco Cisneros. Beyond this, communal police in the El Paraíso house of justice, Ayutla de Los Libres municipality, blockaded highways in Tixtla, Olinalá, Atlixtac, and Huamuxtitlán to reject the structural reforms proposed by the Pact for Mexico and to support the coastal communities (like the CECOP) in their struggle against harassment by the military. They affirmed that their principal demand for the state government was for it to put an end to the harassment exercised by state, federal, and municipal police, as well as that by the Army and Navy. 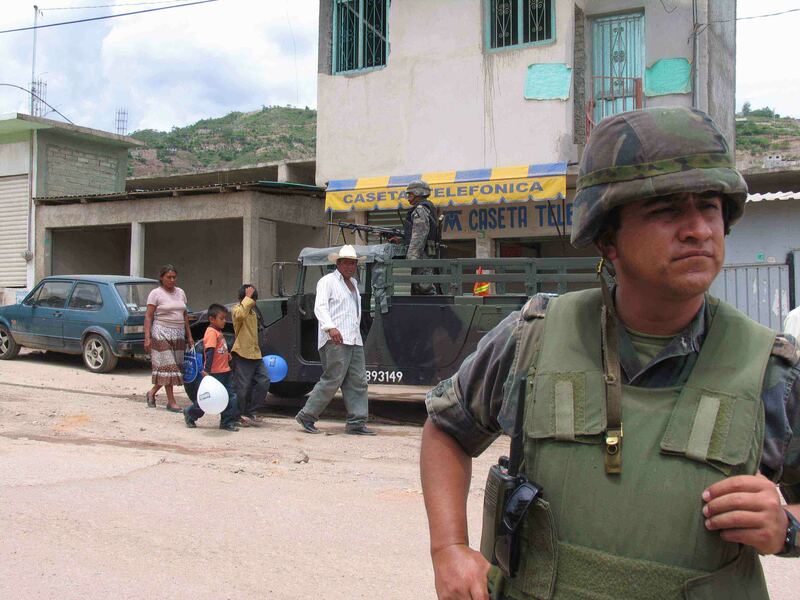 On 17 July, some 180 families from 5 communities of the San Miguel Totolapan municipality abandoned their homes after having received death threats from organized crime groups which operate in the Tierra Caliente region of Guerrero. Those displaced noted that before leaving, they had requested the assistance of the state government, but met with no response, and for this reason they decided to flee–this after three days of gunfire which left several persons injured and some homes burned down. On 18 July, the state government announced that it would support them with food aid, and that soldiers and state police had been transferred to the region to guarantee their security. The majority of those displaced returned to their communities shortly thereafter, with only 40 persons being left in temporary housing. On 18 April, thousands of members of the Popular Movement of Guerrero (MPG) and sympathizers from other states marched through the Sol Highway and subsequently took the state Congress to demand that the legislators hold session to approve the decreed reform of the State Law on Education No. 158. It is estimated that 80,000 people participated in the mobilization. Upon learning that the legislative session had not begun, the protestors decided to take the building. Minutes after the occupation of the Congress, the MPG leadership received a telephone call to organize a dialogue-table with governor Ángel Aguirre Rivero in Casa Guerrero, where the 50 members of the negotiation team led by Gonzalo Juárez moved. The commission of 15 deputies was led by PRD official Víctor Salinas, president of the Education Commission, to analyze the proposed changes to the law.Protestors were joined by teachers from Oaxaca, Michoacán, Morelos, Puebla, Zacatecas, and Chiapas, as well as Mexico City; similarly, members of the Mexican Electricians’ Union, #IAm132, workers from the Autonomous University of Guerrero, the College of Bachelors, retired people, normalist students, campesin@s, and some 50 members of the Communal Police from the House of Justice in El Paraíso, Ayutla de los Libres municipality, also joined the march.